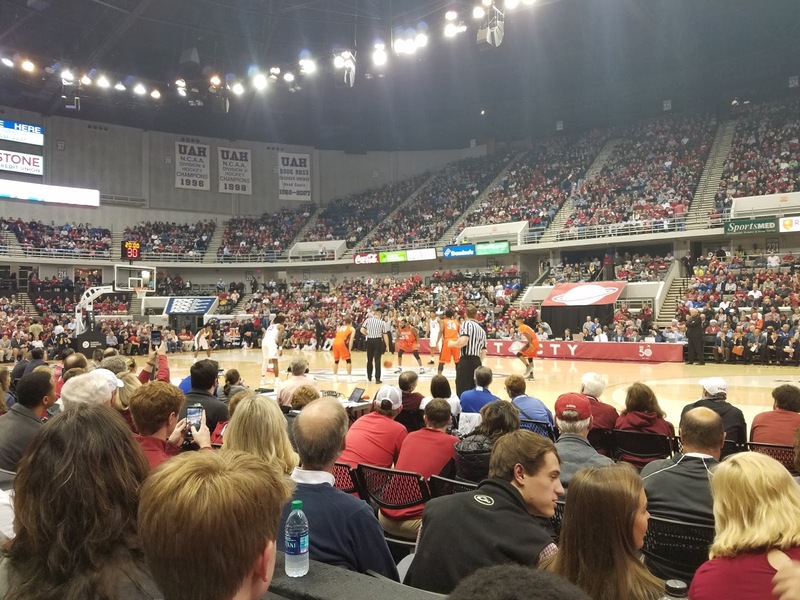 Alabama came out flat and struggled much of the game, but finally took control before nearly collapsing in epic fashion in the final minute of the game. Braxton Key got the start in his season debut over Riley Norris, but he did not look ready. He had a turnover and a foul within the first minute of the game, and finished with 3 turnovers and 4 rebounds without scoring in 20 minutes. His turnovers were generally unforced, terrible passes. It will be good to get the old Braxton Key back, but he's extremely rusty right now and I fear it may take a few games before he's able to contribute in a positive way. 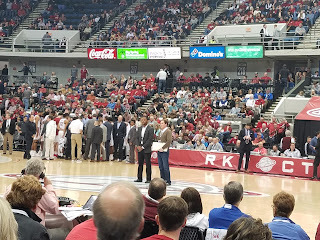 Collin Sexton picked up a couple of cheap early fouls, one of which was 90 feet from the basket, forcing him to the bench and further complicating Coach Johnson's substitution rotations. Once again, we risked putting him back on the floor in the first half, and it worked out as he was able to play smart and avoid picking up the third foul, but he needs to learn to avoid picking up the 2 quick fouls. Coach spoke before the season about the importance of figuring out a rotation early, and I realize that foul trouble and players returning from injury have complicated that process, but it's frustrating to be near the end of December again and many roles are still undetermined. I really think the hap-hazard substitutions and quirky lineups are a big part of our turnover and defense problems. Mercer coach Bob Hoffman whined to the officials just as much as Rhode Island's coach did, and he was called for a technical in the first half after losing his cool on a play that resulted in a wide open dunk for Donta. I did not see what he was so upset about on that play, unless I missed an off ball clear out on a screen or something, it looked just like a missed defensive assignment. The ball did go off an official earlier in the possession possibly preventing a turnover, but that doesn't seem likely to have set him off in such a manner. In any event, Hoffman complained about everything the entire game and was fortunate he was not ejected. 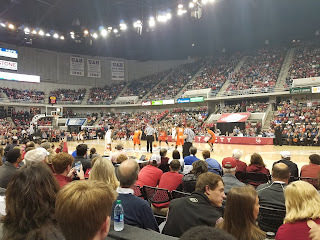 After Petty made one of the two free throws we had a 6 point lead, but thanks to sloppy turnovers and poor shooting, Bama was 1 for 16 from 3 point range in the first half, Mercer had a 35-31 lead at halftime. Petty had a nice game in front of his home crowd. Despite a couple of costly turnovers and bad shot selection decisions, he found his range in the second half and scored 18 points. He was a big part of the 13-0 run around the 8 minute mark that seemingly gave us control of the game. The coaching adjustments were fun to watch in this game. We appeared to find a mismatch with Giddens in the post, but Mercer countered by going right after him on the other end and quickly sending him to the bench with foul trouble. Playing defense without fouling continues to be a struggle for Dan. Donta picked up right where Giddens left off, but with better defense. This prompted Hoffman to switch to a 3-2 zone, which prevented the entry passes and also stymied Sexton's ability to penetrate. With Riley in a shooting slump, Coach turned to Alex Reese to come in as a stretch 4 to spread the zone. He made a couple of huge 3s from the corner, which forced Mercer to extend the zone allowing Sexton to create off the dribble. We were able to get into the press a bit and speed up the game. With an 8 point lead in the final minutes, it appeared that Alabama was finally in control. Until we weren't. Our very own Ron Steele was in the house! Dazon made a pair of free throws to give Bama an 8 point lead with 26 seconds remaining. Mercer scored to cut it to 6 with only 11 seconds left, and immediately called a timeout. I even made a "Reggie Miller is not walking through that door" comment that nearly came back to bite me in the back side. 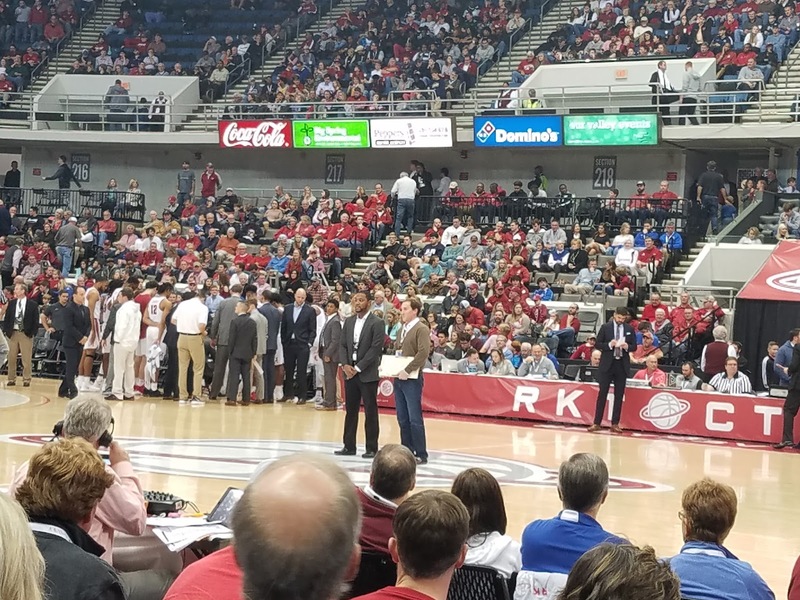 Collin Sexton was mauled on the in-bounds play and there was no call, but the ball was initially rewarded to the Tide pending replay. Of course the call was overturned so Mercer got the ball back. Please allow me to go on a little rant about the college replay rules here. Officials want to get the call right. There is no good reason why, when reviewing a late game out-of-bounds or clock situation, they shouldn't be able to correct a clearly missed foul call. We can change out-of-bounds, waste minutes and give free timeouts while adjusting for tenths of seconds, change blocks to charges or vice-versa depending on the restricted area, but for some reason a blatant foul which causes a turnover is not subject to scrutiny? It makes no sense. At the very least, officials should be given latitude to award the ball back to the offensive team in that situation. It's not uncommon for officials to pass on a close foul call, but give the ball to the aggrieved team in a 50/50 out-of-bounds situation. It's a reasonable solution to managing the game, but only allowing the out-of-bounds portion to be reviewed negates that in favor of the defensive team. So, a mere 2 tenths of a second run off (which is literally impossible) before we are called for a foul, which is about the worst thing we could do in that situation. Mercer makes them both, so lead is still a relatively comfortable 4. For reasons I still cannot understand, JP, a good free throw shooter, with no defenders within 15 feet of him, decides to try to force a pass up the court, that's intercepted. Mercer quickly drills a 3 with about 2 seconds left on the clock. Rather than use our last timeout and set up an in-bound play and explain that if all else fails, chuck it into the backcourt, we let Petty (again, a freshman taking the ball out in this situation?) in-bound the ball. While he had better options, and it wasn't a great pass, it was a decent pass to an open-enough Riley, who completely derped it and booted it out-of-bounds. Mercer got the benefit of the free timeout as they reviewed the time and decided there should be a full second on the clock. They got a good look at a 3, but thankfully it didn't fall, and we survived. Players were slipping all over the court and it seemed like they spent the whole night wiping up condensation. You see this from time to time on courts with hockey ice underneath, and my understanding is that it's more or less unpreventable when there is high humidity, as was the case in Huntsville last night. I understand the safety concerns, but I hope our administration and the event organizers realize that was an anomaly, even for Alabama, to have that kind of humidity in December. It would be a shame for that to be a hindrance to this event going forward. 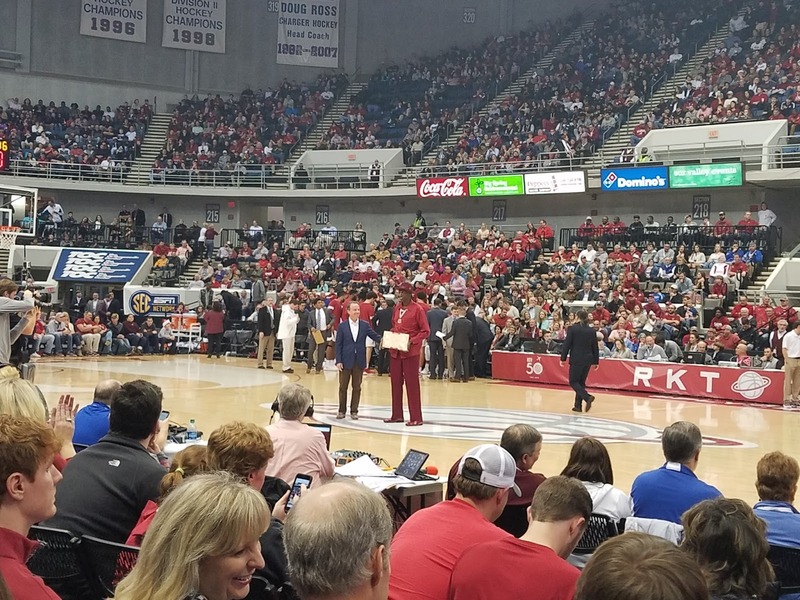 The game was announced as a sell-out, and I would say about 6,200 of the VBC's 6,500 seats were occupied. The crowd was not nearly as loud or enthusiastic as last year's version. I think making this a double-header with UAH actually hurt the atmosphere of this game. Presumably some of the UAH crowd did not stick around, and some who did were less invested in the outcome than the UA crowd. Mercer also had a few dozens fans behind their bench and in the corner of the upper-level. The rainy night and the late tip may have also kept a few folks away. 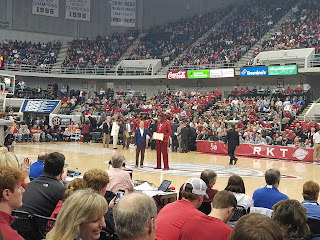 It was great to see former poster Hville, and I especially appreciate him taking the time to give my a car a jump after the game, so I was able to make it back to Birmingham, albeit after midnight. Up next, the Texas Longhorns will meet us just down the street at Legacy Arena in Birmingham for an 8pm tipoff Friday night. Texas is a hard team to figure out, they barely beat Tennessee State but gave Duke a solid game. I think the key will be how we handle the ball against their press. I'm looking forward to the convenience of walking the short block from my office to the game, and I hope we have a big crowd. It will be televised on ESPN2 for those of you who can't make it.